Friday, May 4, Day 2 - Oswego? Monday, September 17, Day 138 - Home! Thursday, May 3 - Binghamton, NY - 114 Miles, 114 For the Trip. Well, I'm off on another trip. Unfortunately, I'm getting started a few weeks later than planned. My refrigerator died - see the "Waiting for Parts" links above. That's now water under the bridge & I'm actually underway. This time I get to start out with the trailer rather than make a 3000 mile trip just to get to it. 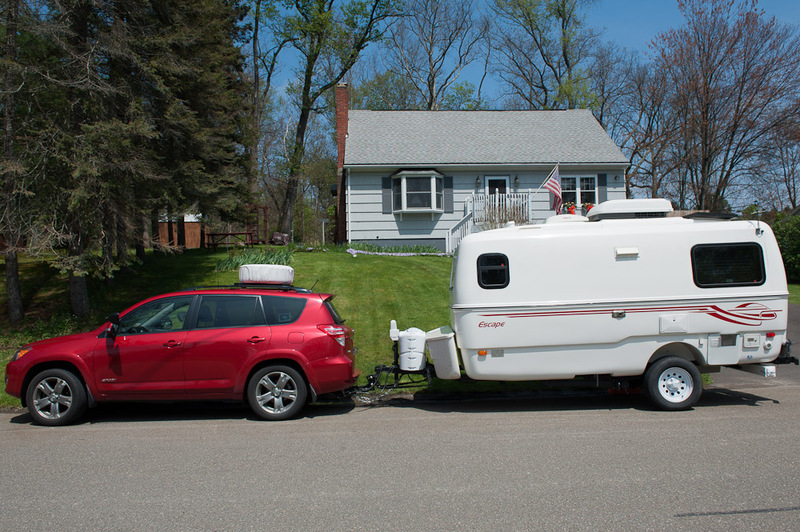 I've finished a bunch of trailer modifications, finished all my doctor, dentist, etc appointments, have the trailer & RAV4 packed, and am finally ready to go. Like all my trips the route, schedule, and just about everything is pretty flexible. I'm starting out heading south this time rather than directly across the country. I want to see a couple of places in Florida, have a stop scheduled in Texas, and want to see some of New Mexico before I head back to Arizona & Utah. Eventually I do have to get to Oregon for a Fiberglass trailer meet in mid July, but that is the only firm date so far. I made it to Binghamton; so far I don't think I forgot anything - in fact, I'm sure. I have probably overpacked, as usual. As to the refrigerator, the freezer is working fine - down to -7°F but the main section seems to have the same problem it had all last summer - it is too warm. 42°F at the moment. I'll have to keep an eye on it - it is possible it is still blowing out the flame while driving since is was down to 36°F when I left this morning. I dropped off one of my Mom's paintings for Anne. She loves my mom's work (which sold quite well in the India Street Gallery on Nantucket) and I have another version of the same painting of the Brant Point Lighthouse (except mine has a couple of people in it & is covered with a "patine" of 20 years of my parent's cigarette smoke - I don't know if that is good or bad since they both died from smoking related causes, but I don't have the heart to get it cleaned). Anyway, this is the view you see leaving Nantucket on the ferry, and we have been visiting my family there for years, so I thought she would appreciate it - she did! Some day I plan to photograph & build a web page of as many of Jocelyn's paintings as I can still locate. 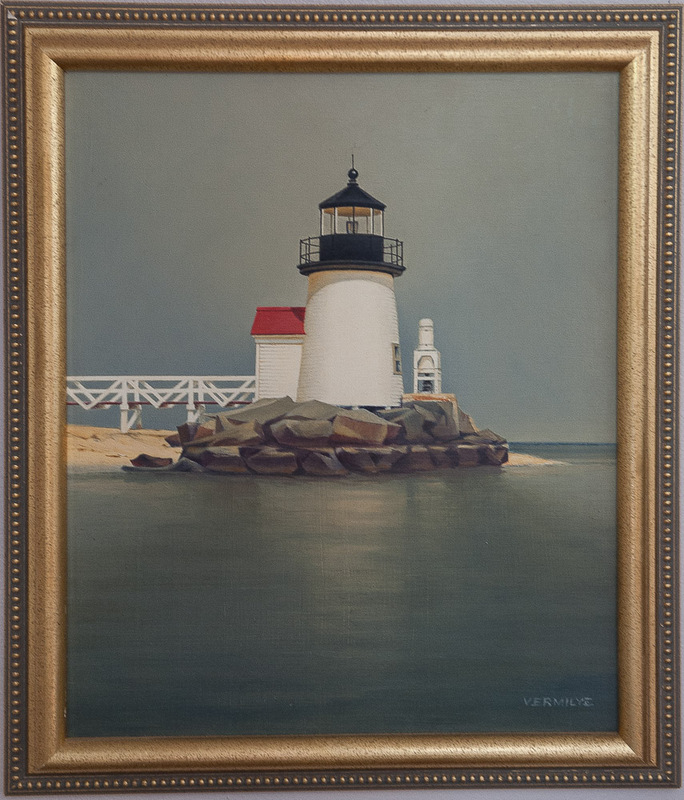 She painted for many years before raising our family, and went back to painting between 1960 and when she passed away in 1996.